This is the Old Fashion & Amazing Coca-Cola Salad. The cherries and cola flavor put this salad over the top. While the added sparkle (air bubbles) that the coke will add to this salad will make it even more of a standout. Drain the cherry syrup and pineapple juices into a saucepan. Set the fruit aside in the refrigerator to chill. Bring fruit juices to a boil, remove from heat and mix in the Jell-O powder until fully dissolved. Put in a 4 cup measuring cup and stir in cola to make 4 cups of liquid about a can of cola. You will need 4 cups of gelatin liquid so you may need to add additional liquid. You can use more coke or else fruit juice or even water to make up the difference. Place the gelatin mixture in a mold and stir in the pineapple, cherries, Allow to fully set for at least 3 to 5 hours or longer - do not stir! For the topping, cream together the cream cheese and sugar; stir in the Cool Whip or whipped cream, until well combined. Use as a topping for salad. 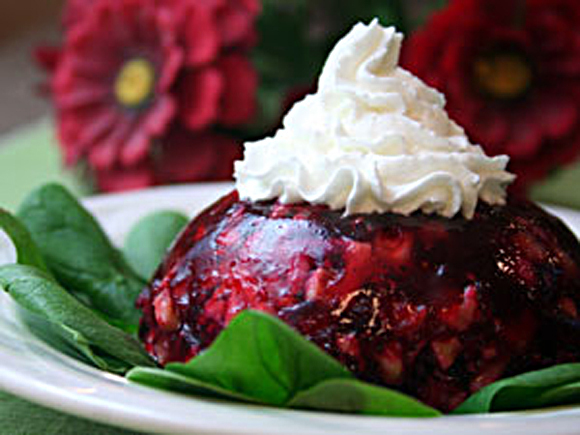 To serve top with a small dollop of the cream cheese topping. You must use sweet cherries for this recipe. Chill the fruit cans in advance if you have time - it will help the gelatin to set. Do not use fresh pineapple as the enzymes in the fresh pineapple will prevent the gelatin from setting. In Canned pineapple the enzymes will have been removed. To increase this salad, just keep the ratio of 4 cups of liquid for every large package of Jell-O you use, or 2 cups per small Jell-O package. To lower the calorie fruit in unsweetened juice, diet cola, low fat cream cheese, Light Cool Whip and sugar substitute can be used.